Leaving your pet at home while you enjoy at the weekend is not a good idea. Though we live in a country where socialising with pets is not a popular concept, here’s a quant and cute pet café in our own Delhi city. Drop in at Puppychino for some great food (for you as well as your pet), unending supply of cuddles, sloppy kisses and of course, unmatched happiness! Remember the puppy face that your pet makes when you leave home? Those sad eyes keep daunting us. As pet parents, we don’t have the choicechicken scream app to take our beloved canine buddies along with us. But defying the stereotypes and breaking rules is the quant and cute dog café, Puppychino. Located in New Delhi (Shahpur Jat), it is the first dog café in the city and what a place it is. If you are a crazy dog lover, then this is nothing less than a slice of heaven for you. As you step in, you will admire the simplicity and the feel good vibes of being at a dog café. But there is a high probability that you’d be interrupted by wet noses, wagging tails and woofs. Simba (Siberian Husky) and Bobo (Labrador) are at your service for a warm fuzzy welcome. Be prepared for a huge doggie hug by the super adorable and naughty Simba. 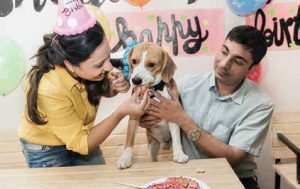 This Idea of opening Puppychino was a dream of Nayani Tandon and her friend Nitin Rana ever since they got their first dog Bobo who was gifted by Nitin. 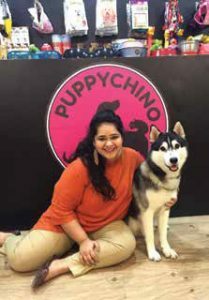 “We didn’t have a place to go along with our dogs; hence we thought of opening Puppychino so that people like us can get their dogs and don’t have to leave them alone at home,” says Nayani. Mallika (Nayani’s sister) helped with the graphics and interiors of Puppychino as well as the café’s menu planning. Nayani decided to quit her job three years ago when they welcomed Bobo to their family. Soon after, Simba followed. Nayani and Mallika were always on the lookout for a place where pet parents could have a great time with their pets. The idea behind uppychino is to have a place where you and your pet can chill and socialise. The café has such a happy feel, and adding dollops of love are of course the bunch of naughty canine companions. You cannot stop yourself from falling in love! Is it safe for my pooch? How do they manage so many dogs together? What if one of them bites my pet? What if they don’t get along with each other? Many of us would be intrigued by the idea of having so many dogs at one place, so I asked Nayani to share the details and the secrets of managing. Weekends are busiest and Nayani proudly boasts that one weekend in August they had 40 dogs in the café at the same time. The café has a small partition. There is an open space on one side and a seating area for humans on the other. Most dogs usually get along with one another and play in the dog area happily. Just in case there is a ‘not so friendly’ four-legged guest, he accompanies the pet parents around their table. “Overall, it has been a pleasant experience with the dogs. They do snap and growl sometimes, but nothing too serious,” adds Nayani. There is a dog handler at the café at all times to handle and control the babies. And also there is a dog trainer available at the café; that’s Nitin who is a major helping hand.